Create a winter atmosphere with artificial snow even in the middle of summer! It is a great choice for photo shoots and Christmas parties. – dry snow generated in the course of pyrotechnical combustion which is perfect for large venues where small snowflakes are swirling in the air. What is very important, the dry snow we offer is made of thin parchment, which is why it leaves no traces on clothes and does not leave surfaces slippery. It has all non-flammability certificates. There are three types of parchment snow available: 10x10mm squares, 6x6mm squares and tiny irregular pieces. This allows us to meet the client’s expectations. Suspended machines can sprinkle snow for up to several hours or create an intense several-minute snow blizzard. The effect is fully regulated. 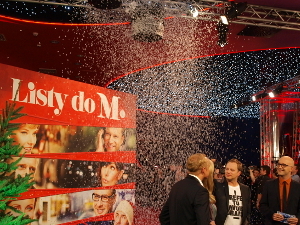 The snow blizzard effect may be also generated with the use of confetti cannons by creating a huge white cloud of several meters in height. Wet snow is definitely a better choice if we want to create a winter setting outdoors. This effect is also fully regulated and we can create small and large sized snow flakes. The liquid we use has been certified and is harmless for the environment. The foam is not slippery but is does leave wet surfaces and this must be taken into account when planning the location. The foam quickly evaporates and disappears without a trace.